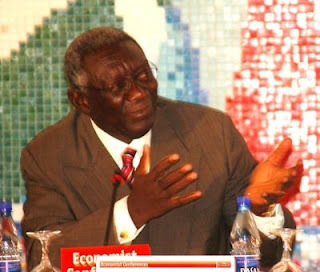 A crunch meeting is scheduled for this evening, Monday October 15, 2007 between President John Agyekum Kufuor and the 19 odd Presidential candidates at Australia house, Accra to iron out fissures that have emerged in certain issues that could cloud the atmosphere and muddy the process leading up to the December 22, 2007 delegates conference. The meeting is at the instance of the Council of Elders of the New Patriotic Party (NPP) and would feature Mr. Odoi Sykes, Ms. Ama Busia, Nana Awuku, Professor Adzei Bekoe and Mr. Ayeh and a few more high ranking officials of the Council.At the heart of the meeting is the issue of fairness which some of the aspirants believe is skewed and which they believe the president could deploy the huge clout he enjoys within the leadership of the NPP to assuage frayed nerves. Key among the multiple concerns at the heart of the aspirants is the needling issue of the President and his not-so-subtle support for Mr. Alan John Kwadwo Kyeremanten which is causing concern. Chief as he is known has not helped matters with his 'in-your-face' interview in the Heritage newspaper in which he literally said 'and so what? Is it not you who say that anybody the president supports loses? 'While some of the aspirants acknowledge that the President is free to support whom he may, they think that his absence of neutrality in the process may impinge on his standing. It is the tinkering of the process which is the source of deepest concern to the aspirants none of who would go on record. 'Some of our friends are DCEs and regional Ministers and they visibly tremble when we attempt to visit them at their offices or homes, because they could lose their jobs. Now we all know so we generally do not expose them to this risk at all when we go on tours', noted one aspirant who spoke the mind of most of the aspirants.A huge pall of unease hangs in the air as the aspirants converge at Australia house today.The property in Cantonments was previously owned by the Australian High Commission but fell into disrepair when the mission left Ghana several years ago. The Ministry of Foreign Affairs at the tail end of the NDC administration took over the house and commissioned Messrs Kufuor and Hallal (J &H) contractors at Takoradi to renovate it. It was widely believed that it was going to be the property of FIt Lt. Jerry Rawlings as part of his end of service benefit if Professor Mills had won the last elections.